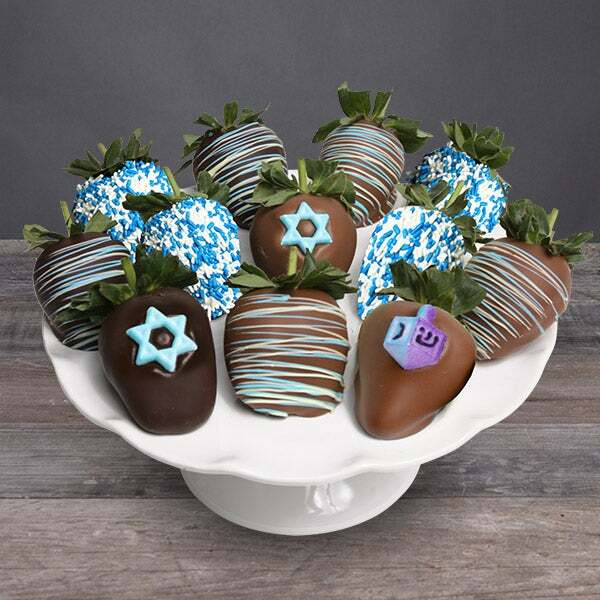 Happy Hanukkah Berries is rated 5.0 out of 5 by 2. Rated 5 out of 5 by SamIAm from A great gift A fun and sweet way to remember your friends at the holidays! Help celebrate the Festival of Lights with these irresistible treats! We start by taking ripe, ruby strawberries and dipping them by hand into baths of sinful, rich Belgian chocolate. Each treat is then elegantly decorated with sweet candy appliqués, brightly colored sprinkles, or ribbons of silky chocolate confection.